If you are applying for a US tourist visa for purposes of marriage to an American citizen in the United States during your brief stay in the country and hope fast track your legal status from tourist/ visitor to immigrant, then you must think twice before doing it. While love does move "in mysterious ways", proving the validity of a whirlwind marriage to the probing eyes of United States Department of State can be extremely difficult and may hold unfavorable and devastating consequences to you and your fiancé/ fiancée. Similarly, if your intention to obtain a tourist/ visitor visa is to marry an American citizen in the United States with the promise of coming back after your limited stay expires, that may still not guarantee you an approval from the US Embassy. Although you may reason that true love is the ultimate cause of your whirlwind marriage to your American citizen fiancé/fiancée, the Embassy is not easily get convinced that you are telling the truth. 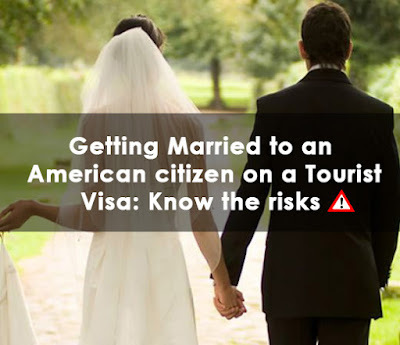 Due to the number of cases of visa fraud involving non-immigrants using their US tourist visas to hasten the process of applying for permanent residence by marriage to their American citizen lovers during their brief stay in the United States as tourists, your case, more than likely, will be an item for investigation. Once the Embassy conducts a field investigation and you fail to prove that your intention to get married is not to hasten the process of obtaining immigrant status by immediately applying for permanent residence after the marriage, allowing you to have a reason to extend your stay in the United States, then you may face fraud charges and possibly be banned from entering the United States. Your US citizen fiance at the same time may be subjected to criminal prosecution if it is proven that he/ she took part in assisting with fraud. Because nothing is impossible, coming to the United States on a tourist visa and meeting someone who is an American citizen and marrying that someone during the tourist visa holder's brief stay can happen. It can even be a viable reason for the tourist to adjust their status from a visitor to permanent residency after the marriage but the potential risks of proving that the couple's intentions are pure and not fraudulent can still be a looming possibility. There are many other ways to get married and obtain immigrant status in the United States but they have certain requirements that involve a lengthier process. Sometimes, for various reasons ranging from poor health to financial constraints, applicants trying to get to the United States on a permanent basis through marriage find ways to shorten the process by resorting to illegal and fraudulent means such as using a tourist visa instead of properly applying for a K1 or Fiancé/ Fiancée Visa. What's the difference between a tourist/ visitor visa and a K1 visa? There are two kinds of visitor visas, a "nonimmigrant visa for temporary stay, or an immigrant visa for permanent residence". A tourist/ visitor visa is obtained by people who want to stay in the United States on a temporary basis. Technically, a tourist visa falls under three categories. The B-1 tourist visa is obtained for business purposes. The B-2 tourist visa is obtained for pleasure such as tourism, vacations or for visiting purposes. The B-1/B-2 tourist visa is a combination of both. According to the US Department of State, obtaining permanent residence is not allowed on visitor visas. To find out what are permitted and not permitted on visitor visas, here. On the other hand, K-1 visa is a non-immigrant visa that allows the applicant to get married with his or her American citizen fiancé/ fiancée for a limited time in the United States. This type of visa allows the applicant to obtain permanent residence after the marriage ceremony has taken place and the proper application for permanent residence had been filed. To get more information about K-1 visa, you may visit the USCIS website or click here. I want to know more about my options, who can I contact? Consulting a licensed immigration attorney is the best option if you want to know more about getting married in the United States with your American citizen fiancé/ fiancée without fear of facing potential legal risks and consequences.